Last year I reviewed The City of Brass and didn’t like it. And I don’t know why I picked up The Kingdom of Copper. It was a struggle for me to get through and I really didn’t like it. 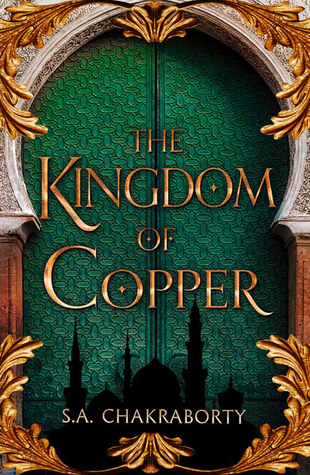 I give The Kingdom of Copper by S.A. Chakraborty one out of five hearts because S.A. Chakraborty’s writing just doesn’t sit well with me. I really don’t care about the Daevabad world and the author couldn’t make me care about these characters. I thought I wouldn’t start on this book when I saw it would come out. But apparently, I forgot how badly I didn’t like it because when it showed up in my audiobook app I just turned it on. I don’t know why, but I listened to it and I wanted to give it one day. By the time I decided I wanted to give up on it I had only 4h left to listen to and decided to just press on. Still writing a review on this novel I find hard. I found the writing style confusing and there is too much happening at any given point in time. The storylines get so messy I didn’t understand half of it. And things start to happen to the main characters instead of them instigating it. I really want to stop reading this series, so I hope that next time I see The Empire of Gold, I don’t forget to check my own ratings before starting it. This entry was posted in Book Review and tagged Book Review, Drama, Fantasy, History, Romance, S.A. Chakraborty. Bookmark the permalink.